Darwins shoes..., originally uploaded by Norma Desmond. I've updated this blog's template to something more readable. This won't make much of a difference to those readers who take in these words via an RSS reader, but just over half my visitors come to the site directly or stumble in here through search engines, so they might like the change. The banner photograph is part of this image called Darwins shoes taken by Norma Desmond. 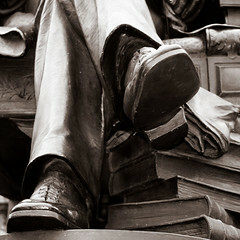 The statue of Darwin can be found by the Shewsbury public library.